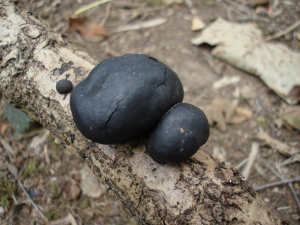 Hard Black fungus, growing on a dead branch, that resemble burnt cakes, hence their name. If you cut into them they reveal a series of concentric rings. Also known as 'cramp balls' - the theory is that if you carry them around in your pockets you will never suffer from cramp.